Has it really been nearly a week since I last posted?! Very neglectful! I have been swimming, going to school, finishing assignments and going to a very cool Malibu party!! Tuesday night- Beachy Head Marathon marshall briefing. We are volunteering to help with the Beachy Head Marathon which is happening next Saturday, 22nd October 2011. We will be starting wtih registration at 7am, and then after registration we will be approx 8 miles in helping with a road crossing. 4 back stroke arms with a pull-buoy, 4 backstroke. Front crawl pacing- in 1 minute 30 secs, swim 2 lengths and rest for the remainder of the time. Twice. Front crawl pacing- in 1 minute, swim 2 lengths and rest for any remainder. Twice. Warm down- 8 lengths of front crawl. Thursday night- Malibu Pamper Party! My friend won a competition run by Malibu to have a Pamper Party thrown by them at her house! They set up and there was a makeshift bar in her dining room, a spray tan tent in the spare room and the beauty bits in the lounge. There was a make-up artist, a nail technician, a spray-tan lady and a mixologist! (A mixologist is a cocktail maker!) He gave us lessons on how to make cocktails using Malibu. We made a Malibu Mojito and a Malibu Cosmopolitan. We had so much fun, and I had a spray tan, my eye make-up done and my nails done. They also brought these amazing cupcakes with them. I now have a gorgeous tan! I have never been this brown in my life, but it’s an expensive habit to keep up, so will make the most of having it this weekend. Here’s a pic of me and my friend who won the party. She is my bestest bestest friend! Wednesday and Thursday were my first two days in the school I will be doing my final teaching practice in. I love it! I start full time properly from Monday. Scary scary! I handed in my Science assignment on Friday and went off to Nando’s with some friends. I was due half a free chicken 😀 it was immense and nearly beat me. Note I said nearly! Last night (Friday) was spent really chilling out. I watched Gardner’s World, Autumn Watch and Autumn Watch Unsprung. I did feel a little old beyond my years! It was so interesting though, and they’ve set up a webcam to watch some badgers. Check it out here. Sooo cool. 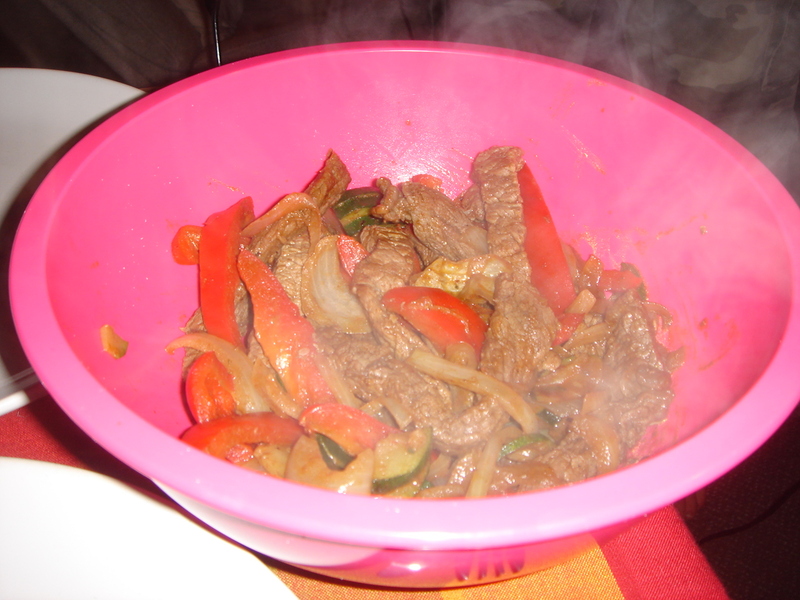 Tonight we had these luscious beef fajitas (without tortillas) with homemade salsa and guacamole. Recipe courtesy of Jamie Oliver, and with beef rather than chicken. We have had some really lovely dinners this week. 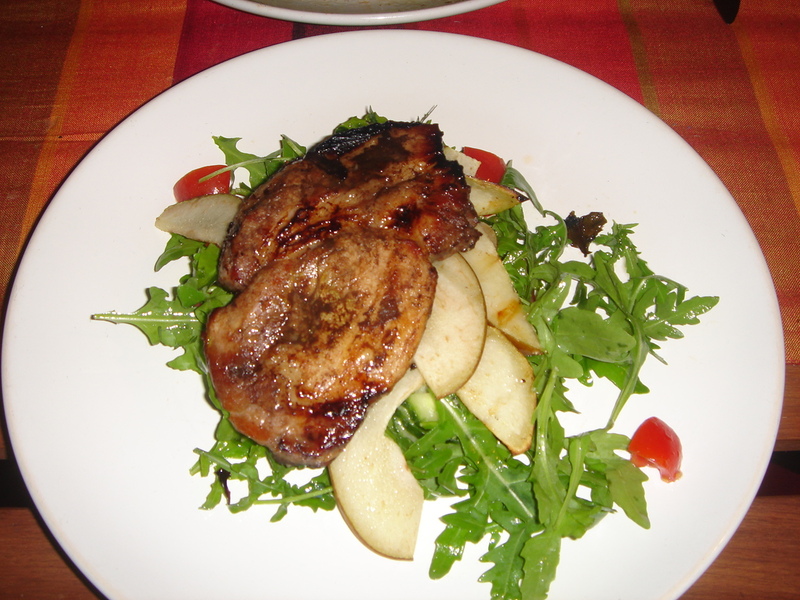 Rob cooked this dish of balsamic pork over a grilled pear and rocket salad. Mmmmm! Tomorrow is mine and Rob’s 7 year anniversary 🙂 so we’re off out for lunch somewhere, we haven’t decided between Lewes or Brighton yet, so will see how we feel tomorrow. Hope you’ve all had a great week! Enjoy the rest of your weekend. Don’t forget my tea giveaway, there is still time to enter. I totally agree with the title- the light is just beautiful at the moment. That party sounds like so much fun! I’ve never had a spray tan but seeing my friend look like an oompa lumpa put me off a bit! U look fab tho!